Leonardo da Vinci has become the ultimate archetype of the creative genius. Besides his famous paintings, including the Mona Lisa, da Vinci had insights into anatomy and optics that would take science a few hundred years to verify. While Leonardo’s genius seems like a gift from the gods, my guest today argues that it was actually the result of years of human effort and toil. Today on the show I have the pleasure of speaking with famed author Walter Isaacson about his latest biography called Leonardo da Vinci. 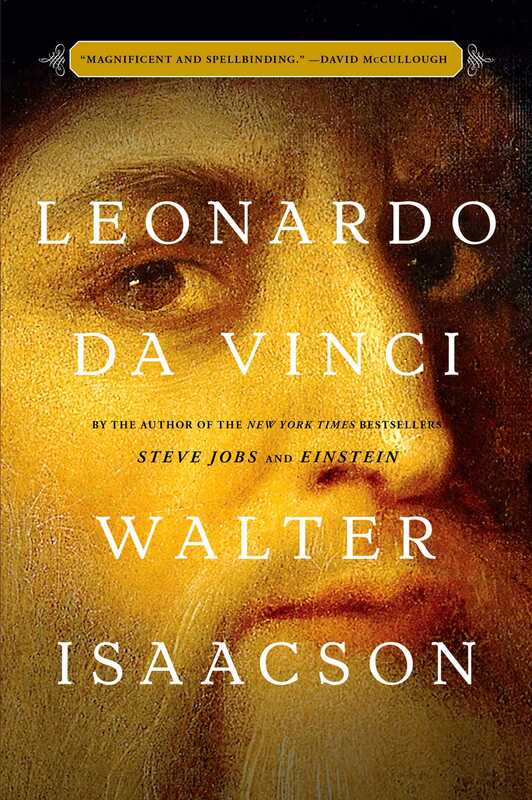 We begin the show talking about what has drawn Isaacson to write about innovative individuals like da Vinci, Benjamin Franklin, and Steve Jobs, and how Isaacson has discovered that it’s at the intersection of science and the humanities that all great innovations are made. We then dig into the life of da Vinci and lessons we can take away from him. Walter tells us about da Vinci’s famous notebooks and what he kept in them, and makes the case that all of us should be carrying around a little notebook for ideas too. We then dig into the the myth of the solitary genius and how Leonardo collaborated all throughout his life on some of his greatest works. We then discuss one of the great paradoxes of da Vinci’s life: that he could be both intensely focused and hugely flighty, and how both sides of this character were key to his genius. We end our conversation talking about how we can develop the same kind of power of intense concentration that da Vinci wielded, even in our distracted, digital world. What is Isaacson’s draw to writing biographies about innovators? Did da Vinci care about getting credit for his works? Leonardo da Vinci is a tome of a book, but like other Isaacson biographies, you get sucked in and lose track of how long you’ve been reading because of how engaging and interesting it is. I learned a lot, not just about da Vinci, but also about Renaissance Italy. Harry’s. Upgrade your shave with Harry’s. Get a free trial (you just pay shipping) when you go to harrys.com/manliness. The trial includes a razor handle, 5 blades, and shaving gel. Visit today and take advantage of this exclusive offer! Brett McKay: Welcome to another edition of The Art of Manliness Podcast. Leonardo da Vinci has become the ultimate architect of the creative genius. Besides his famous paintings, including the Mona Lisa, da Vinci had insights into anatomy and optics that would take science a few hundred years to verify. And while Leonardo’s genius seems like a gift from the gods, my guest today argues that it was actually the result of years of human effort and toil. Today, on the show, I have the pleasure of speaking with famed author, Walter Isaacson, about his latest biography on Leonardo da Vinci. We’ll begin the show talking about what has drawn Isaacson to write about innovative individuals like da Vinci, Benjamin Franklin, and Steve Jobs and how Isaacson has discovered, through his writing, that it’s the intersection of science and humanities that all great innovations are made. We then dig into the life of da Vinci and lessons we can take away from him. Walter tells us about da Vinci’s famous notebooks, what he kept in them, and makes the case that all of us should be carrying around little notebooks for ideas, too. We then dig into the myth of the solitary genius and how Leonardo collaborated all throughout his life on some of his greatest works. We then discuss one of the great paradoxes of da Vinci’s life, that he could be both intensely focused and hugely flighty and how both sides of this character were key in his genius. We end our conversation talking about how we can develop the same kind of power of intense concentration and observation that da Vinci wielded, even in our distracted, digital world. After the show’s over, make sure to check out show notes at aom.is/davinci, that’s just one word, davinci, where you can find links to resources where you can delve deeper into this topic. Alright, Walter Isaacson, welcome to the show. Walter Isaacson: Thank you. Thanks for having me. Brett McKay: So, I know a lot of our listeners are familiar with your work. Got a new book out about Leonardo da Vinci. Before we get to this latest biography, I’m curious about your writing career. Biographer and the topic you’ve chosen, it seems like, are innovators. You’ve done a biography on Benjamin Franklin, Steve Jobs, Albert Einstein, you even have a biography called The Innovators. What’s the draw? What got you started down that path? Walter Isaacson: You know, I realized over the course of my career that I’d met a lot of smart people, but that smart people often don’t amount to much. The question is how do you be innovative? And so I tried to write a book about what is creativity and how do you achieve it? And I do it through biography because I want to show, whether it’s a Benjamin Franklin, Steve Jobs, or Leonardo da Vinci, how being able to cross disciplines, to see patterns across nature, to love both art and science, to love both the humanities and engineering, that’s what makes people see patterns, like Steve Jobs did, like Franklin and Leonardo da Vinci did. And that’s what helps them sort of think outta the box, be more innovative. Brett McKay: Got you. Your latest book, da Vinci, was fantastic. It’s just super thorough and I imagine this was a challenge because the subjects of your other biographies, they were alive in either the 20th century or within the past 200 years, so there were a lot of primary source documents to go to. Letters, pamphlets they wrote, etc. da Vinci lived 500 years ago and this is when the printing press was just invented. So, how were you able to get inside the mind of da Vinci and see where his creative genius lies? Walter Isaacson: Leonardo left us 7,200 pages of his notebooks. That’s more than I had from Steve Jobs. That’s more than I’d probably get from any of my friends right now. Papers are wonderful technology for the storage and retrieval of information. And so we can see as his mind goes across page after page, making sketches for The Last Supper, then trying to figure out how outward gestures and facial expressions relate to inner emotions. But then also connecting the nerves to the spinal cord to the muscles of the face because he wants to go deeper with anatomy, on figuring out how our expressions work. All of these things are in his notebooks and so I decided to base this book on a reading of all of his notebook pages and among the many little things that inspired me to do is to remember we should all keep notebooks. We should all jot down our to do lists and keep them in a notebook so that years later, we can remember the type of connections we made when we saw different things. Brett McKay: And were these commonplace books, notebooks that he was using? Walter Isaacson: These were things that were leather-bound, some of them he kept on his belt when he walked around town and he would put anything in them. His shopping list. He would put a recipe for making blond hair dye when he was in his 30s because he was very beautiful and had wonderful, curly hair, well-built physique and figured he was probably worried about going gray and so he puts a recipe for boiling nuts and oil to make a hair dye. He put some questions he wants to answer, like how would you measure the size of the sun, or what does the tongue of a woodpecker look like? And then he would sketches of people that would end up being studies for his paintings. So, they had everything from words to shopping lists, to pictures. Brett McKay: Yeah, and he also spent a lot of his time just trying to square a circle, right? Walter Isaacson: Well, one of the challenges is transforming shapes. If you’re an artist, or an engineer, you wanna say, how would one shape move and be a slightly different shape, but be the same volume, or be the same area? And the most ancient of problems in that sort is called squaring a circle, which is how do you take a circle of a certain area and say, “I’ll make a square that has the exact same area”? And that’s hard to do because pi is an irrational number, so just with a ruler and a protractor. But Leonardo spent five decades of his six decade life, ever since he was a young kid, to his dying last notebook page, looking at ways to square a circle. Brett McKay: And a lot of, as you highlight in the book, a lot of da Vinci historians they criticized him for that. Like he was wasting his time on this, when he could have been doing other things. But you argue that was all part of the process of him becoming the genius that he was. Walter Isaacson: Yeah, I mean, he did anatomy drawings. He did squaring of the circles and math. He did engineering, tried to build flying machines. And some art critics will say, “Well, if he hadn’t wasted his time doing that, he would’ve painted more paintings.” Well, sure, he may have painted more paintings, but he wouldn’t have painted the Mona Lisa. He wouldn’t have been Leonardo da Vinci. That ability to know the patterns of nature, to know not just useful things like how many muscles and nerves control the lips and that helps you with the Mona Lisa, but to also have a profound philosophical feel for how we’re connected with nature. That also ends up with the Mona Lisa, as opposed to just being a craftsman who can turn out paintings. Brett McKay: So, I thought it was interesting you argue that da Vinci was a genius, yes, but he wasn’t born with that gift, that he had to work for it. What led you to that conclusion? Walter Isaacson: Well, you know, you look at his notebooks and you say, “Oh my goodness, this guy is human. He’s made a math mistake here.” Or, “He’s human, he’s actually not finished this painting.” Or, “He was drawing a dissection of human heart and he pauses and then draws his companion, Salaì, his male companion around the heart.” Which is sort of endearing. So, he’s not like an Einstein who can take tensile calculus and use it to describe the curvature of space and time. He’s not one of these people with grand mental processing power. But he’s somebody who has a curiosity and a sense of observation where he just is curious about everything there is to know about everything that can possibly be known. And that is something you and I can relate to better. We’re never gonna use tensile calculus to describe space time, but we will be able to pause like Leonardo did on any given day and say, how do the wings of a bird flap, up or down, fast or when it’s taking off? The comment why is the sky blue, the commonplace things that you and I quit wondering about after we get over the age of 10, but people like Leonardo still wondered about. So, his genius was a little bit more self-made. It was a little bit more self-willed. It wasn’t as if he was touched by the heavens with some amazing mental processing power. Brett McKay: So, I think another popular idea of da Vinci that’s out there is that he was sort of this lone genius, eccentric genius, working alone in his workshop in Florence, but as you highlight in the book, for most of his career he was working collaboration. Can you describe some of the collaborative process that da Vinci used to churn out paintings or come up with innovations in engineering, etc.? Walter Isaacson: He realized that creativity was a team sport and it’s something I’ve written about when I wrote about the innovators, which is how people collaborate in order to innovate. Leonardo was, from a very young age, part of a workshop in Florence and they did many things. They soldered the copper ball that gets put on the dome of Florence’s cathedral. They do paintings or like the Baptism of Christ in which four or five of the painters in the studio each do a different part of it. So, throughout his life, Leonardo has a studio of students and associates who work with him and one of the problems, like he did two versions of a painting called Virgin of the Rocks, is figuring out what parts of the painting were truly done by Leonardo and which by his partners. And yet, that’s almost asking the wrong question because the question is how did they collaborate to make such a good painting? Most famously, Vetruvian Man, you know, the naked guy standing in the circle and the squares spread eagle, Leonardo did that drawing totally by himself, but he did it during a few week period where he’s working with three of this best friends to figure out how would you do church designs and make humans proportional to the design of the church. And so they all do drawings as well and you look at that collaboration that results in Leonardo drawing Vetruvian Man. Walter Isaacson: Not really. Leonardo did not focus on getting credit or even getting payments sometimes from his work. He sometimes kept his works, including the Mona Lisa, and did not deliver to the patron who paid for it. He kept it throughout his life so he could perfect it. Also, he doesn’t sign his paintings. There’s a painting going on sale on November 15th called Salvator Mundi, which is the last Leonardo painting in private hands. It’s gonna be auctioned off and there’s a little dispute about was it really… how much of it was Leonardo because he never signed his work. He never wrote I have now finished Salvator Mundi and I’m selling it to so-and-so. So, I don’t think he was one of those artists who did it for fame or fortune. I think he did it to please himself. Brett McKay: But Michelangelo would be a contrast to that. He was very sensitive. Walter Isaacson: Michelangelo was very reclusive, had no real close friends. He sort of stayed off on his own, was not particularly friendly to Leonardo da Vinci. And so when he does his statue of David, he goes off and holes up by himself doing that statue of David and yes, he’s got a little bit more of the agony in him about his life. Leonardo’s very comfortable with himself. Brett McKay: So, you mentioned earlier that Leonardo was one of the very… One of his geniuses was blurring the lines between science and art. I’m curious, what ways did his science explorations inform his art? Walter Isaacson: Well, they’re very specific ways, such as having done page after page of how the muscles touch the lips and which nerves control the muscles, he starts sketching in 50 note 3 what will be the world’s most famous smile. He begins to paint the Mona Lisa. But also, his anatomy science was done to help inform his art like he would dissect the muscles of the neck and then perfect his painting, St. Jerome in the Wilderness. But being Leonardo, he would then drill down and pursue anatomy simply for his own sake. Simply for curiosity. I mean, after getting all of the muscles of the face and the neck, which is what he might need for a painting, he dissects the human heart. He dissects the liver. He dissects the spinal cord and every bit of the human body and makes layered drawings of the whole human body. So, it’s an inspiration for most of us that Leonardo starts of being curious about things that might be useful for his art, but then pursues curiosity for curiosity’s sake. I call it the tongue of the woodpecker phenomenon, which is he didn’t need to know what the tongue of a woodpecker looked like in order to do a flying machine or paint a painting. He needed to know because he was Leonardo. He was just curious about everything. Brett McKay: And he did make insights into anatomy, that wasn’t confirmed until a couple hundred years later. Walter Isaacson: Yeah, one of his insights on anatomy, for example, is how the heart valve works. The insight comes from having watching how a river when the water hits an obstacle, how it swirls and curls. And he says the heart valve opens and shuts because of the swirl of the water, not because of the pressure of the blood. Those are great discoveries. And so by seeing patterns across nature, he may not have known initially, well, why do I care about how swirls of water work? But it helps inform everything from the curl of the river that flows from the mountains to the back of the Mona Lisa to the curls and swirls of blood from the heart to the aorta that show how the heart valve works. So, that’s what makes him a genius is loving to see patterns in all sorts of fields. Brett McKay: Yeah, and he also deciphered how light hits the retina and with that information, he was able to change perspectives in his painting that people weren’t doing. Walter Isaacson: Sure, you have a sort of accelerated perspective in The Last Supper because of his understanding of optics and perspective. But most amazingly, the lips of the Mona Lisa have the tiniest black and white details that turn down at the end of the lips, but the shadows and colors turn up at the end of the lips because he knows that you see detail at a different part of your retina than you see shadows and colors. So, as your eye wanders across her face, the smile turns on and off. It becomes an interactive smile. So, that’s another way that his science connects to his art. Brett McKay: So, in the book, you highlight da Vinci’s maxim in life was just direct experience, right? He wanted to experience things firsthand, which he did, but then you show in the book that as he developed as an artist and as a scientist, he started to incorporate theory. How did da Vinci balance scientific theory, and direct scientific experimentation? Walter Isaacson: Yeah, that’s a great question because it makes him a forerunner of the scientific revolution and the Enlightenment. He had the good fortune to be born out of wedlock, which meant he wasn’t sent to a university or a Latin school. And he becomes what he calls a disciple of experience, meaning whenever anybody says something, he tries to figure out can I test that? How do I know it’s right? But then he also becomes a disciple of books because Gutenberg’s printing press has come into play and he can get any book he wants. Anything from Euclid to poetry and so he becomes a voracious reader. And so what he does is sort of a back and forth process that we now take for granted, which is he’ll have a theory or read of a theory, such as why water gets at the top of mountains and flows down as streams, and then he’ll say, let me devise ways to observe or test that and see if that’s right. And then if his observations or experiments show that there’s something wrong, he revises his theories. Sometimes nowadays we forget to revise our theories when we get new facts, but Leonardo was always going back and forth between having theories about how things worked and even reading other people’s theories about how things worked and then testing those theories based on facts. Brett McKay: Yeah, and the other kind of insight I got from reading about da Vinci’s life in your book was his use of analogies to form new insights. So, he would see the veins in the human body and the veins in a leaf and say that’s similar and he would try to find some connection. Sometimes that led him down the wrong path, but making those connections started him to go down new paths and come up with new ideas. Walter Isaacson: Yeah, I mean, analogy is sort of a rudimentary form of theorizing. For example, he looks at the way rivers have tributaries and then he calculates that the size of each of the tributaries adds up to the size of the main river when they flow in. And he says, “Well that’s the same to a blood vessel” as he dissects the human body. And then he’ll look at a tree and realize trees have branches and it becomes Leonardo’s law of branching as he understands how branches relate to the size of a trunk. And there’s a wonderful notebook page where he has his craggy old warrior that he loves to draw, but there’s a tree that sort of grows into the warrior’s torso. And it sort of shows the branchings of the tree and the branching of the warrior’s veins. So, it’s his way of saying, “Let me make an analogy.” As you said, sometimes he got it wrong. He made the analogy that maybe waters that flow from the top of mountains, the mountain streams, the water gets up there the way the blood gets to our nose and we then have a nosebleed. It gets pumped up through our bodies or he said pumped up through the earth and then comes out as streams. But he’d test that and he looks at it, he does his geology and he realizes, well that’s not how it works. So, he comes up with a new theory, which is that the water evaporates. It becomes rain and that’s how mountain streams form. So, you see even within this one notebook, a notebook that happens to be owned by Bill Gates, the Codex Leicester, and beginning with one theory about how there’s an analogy between our body and the earth. But then revising that theory when his experiments show that the earth doesn’t work exactly the way the veins in the body work. Brett McKay: So, one thing else I was fascinated about in the book is that da Vinci was a master painter. You know, some of the greatest paintings he did. But it seemed like, throughout his career, it’s not what he wanted to be known as. It was always an afterthought, right? When he wrote that letter to the Baron to get a patronship, the fact that he was a master painter and was like, “Oh, I also paint.” But he said all this other stuff he could do. What do you think was going on there? It seemed like da Vinci was kind of fighting against his innate talent of painting. What do you think was going on there? Walter Isaacson: Well, part of what’s going on is that he’s a human. This was just as he’s turning 30. May actually have many listeners who either are dreading that upcoming milestone, or remember that milestone. Very unnerving of turning 30. And he’s messed up two paintings during his 20s that he doesn’t finish. Paintings that his father helped him get the commissions for, Adoration of the Magi and St. Jerome. So, I think sometimes when we look at historical figures, we have to realize how human they are and even looking to ourselves and say, yeah, do you remember when we thought, okay, we were gonna be a playwright, but now we’re gonna try to be a designer of a web app or something? We go through parts of life where we get discontented about what we’re doing. It all does come together at the end, though, where Leonardo realizes that art and engineering aren’t that different. They’re both about creating beautiful strokes that show us the wonders of the infinite beauties of nature. Brett McKay: And in that résumé, that letter, it was a lot of puffery. Because he hadn’t done any of those things that he said he could do. Walter Isaacson: Very human, yeah. Anybody ever do résumé inflation. Yeah, he talks about diverting the course of rivers. He’s not quite done it by the time he writes that letter, but he goes on to work with Machiavelli and Cesar Borgia and the people in Florence to say, okay, here’s how you would dig ditches to divert the course of the Arno River. And they actually work on it and dig the ditches. It doesn’t fully materialize, so it’s another lesson from him. Sometimes it was what Steve Jobs called the reality distortion field, which is you imagine you can do things, you push people to do things they think are impossible, and sometimes you actually get them done. So, yeah, in that job application letter, he hadn’t done many weapons of war or diverted many rivers, but it’s him saying, okay, I think I could do this. Brett McKay: He was doing. Walter Isaacson: It’s like big pageants. Big plays. You know, we forget, there was no TV, there was no SuperBowl, there was no internet or movies back then. And so when it was time in the evening for people to be entertained, there’d be pageants and plays and outdoor spectacles. And so Leonardo helped do the scenery for those. He helped do the ingenious devices, like bringing the angels down from the rafters. And one of those ingenious devices was an aerial screw, which we now think of as the first helicopter because Leonardo blurs the distinction between fantasy and reality. He goes on to figure out, well, could that aerial screw I used in that play actually be something that would transport a real human? And so, whether you’re looking at The Last Supper, with the accelerated perspective and exaggerated gestures and it looks all of a sudden like a theater set when you look at it that way, or when you look at some of the devices and engineering he built and realize they began as devices for the theater and you look at some of his drawings and realize they’re drawings for costumes in the theater. So, that was a way for him to jumpstart his imagination. And I think one of the misunderstood things about Leonardo that I was able to find by going page after page through his notebooks, is how important it was to the formation of both his engineering and his art that he spent most of his time as a young man producing pageants and plays. Brett McKay: Yeah, I loved that insight because oftentimes we think of these great geniuses as sort of venerated. Like godlike, but they were doing sort of crass commercialism. But there’s value in that, too. I think it’s important not to discredit that. Walter Isaacson: That’s how he made his living and by the way, I’m sure there are lots of people listening to this podcast or people like myself who at times will say, okay, I’m gonna try to do a screenplay. Or I’m gonna try to invent some new app. Or I’m gonna do something ingenious and I’m gonna do it because maybe I’ll make a buck by writing this screenplay or putting on this event. Brett McKay: Well, that brings us to an interesting point and I love this in the book because you do such a great job talking about sort of the Renaissance culture and these competing fiefdoms and patrons. And what I thought was interesting is Leonardo had to be very political, in a way, because that’s how he earned his capital. He had to go to a patron and find out what they wanted and try to do that, but at the same time, it seemed like da Vinci didn’t really care. So, what can we learn about da Vinci juggling the interest of economics and creativity that often is economically inefficient? Walter Isaacson: Right. Well, first of all, Leonardo never produced things purely for the money. Every now and then, he made a living as a pageant producer as we said. But even when the richest person in Italy, the richest woman, Isabella d’Este, is saying paint my portrait and I’ll pay you anything, he decides instead to paint the wife of a middle class cloth merchant in Florence named Lisa and he never even delivers the Mona Lisa to the cloth merchant because he’s doing it pretty much for his satisfaction. And to have a universal understanding of nature. And he then didn’t die incredibly wealthy, even though he was the great artist of his time. I also think that if you’re driven simply by commercial considerations, you’re never going to try to make something perfect. You might be willing to cut corners and Leonardo, as I said, took 16 years on the Mona Lisa. He put aside the Adoration of the Magi when he couldn’t make it perfect. And he spent a lot of time doing dissections or math experiments on squaring the circle that certainly weren’t driven by money. But it ends up making him the most well-rounded, deeply enriched intellect and talent of his time and that should be an inspiration to us as well. Which is always have your passion be for the product, not for the profit. Brett McKay: Well, you’ve raised another interesting point. So, you mentioned that he’d take forever on some of his work, sometimes he wouldn’t even deliver it. I mean, he seemed kind of like a dilettante, right? Like he would just jump from thing to thing and it sounds like his dad got onto him a bit for that. But was that a key component? Walter Isaacson: Ever know anybody like that? Yeah. Brett McKay: But was that a key component to his innovation and creativity? Just his flightiness, his creative flightiness? Walter Isaacson: Well, he could be both obsessed and do page after page of dissections of muscles. And page after page of trying to square the circle and transforming geometric shapes and he could be distracted at times, which is he’d go in, paint two brush strokes on The Last Supper, and then climb down and disappear for the rest of the day. So, I think if he were alive today, people keep coming up to me and they’ve read the book and they say, well, wasn’t he somewhere on the autism spectrum? Or wasn’t he dyslexic? Or wasn’t he obsessive or compulsive? Or wasn’t he, you know, ADHD and distracted and attention deficit? And I think you can apply all sorts of modern acronyms to him and letters and pull down a manual and maybe even prescribe a pharmaceutical regimen, but all of those traits made him very quirky. But it also allowed him to wrestle with his demons and his dragons and his angels and produce some of the most amazing engineering and art in history. Brett McKay: Could someone like Leonardo exist in our modern world? As soon as they see things like that, they would wanna give it a letter, an acronym and then give him a prescription of some sort. Walter Isaacson: Well, I think we can all kind of avoid that which is yes, we should applaud the wonders of modern medicine and psychology and it helps when people are troubled. On the other hand, we should nurture creativity and quirkiness and Leonardo was a misfit. He was a misfit and he was gay, he was left-handed, he was illegitimate, he at times was obsessive, he was at times both depressed and then elated. And at times he didn’t finish his work and he would procrastinate. And yet, in Florence in the 1470s, he was not only tolerated, he was loved as a young man. So, we all have to be tolerant of people who, to use Steve Jobs’ words, think different. Brett McKay: Yeah and I love the humanist, too, that you highlight in the book and we’ve talked about. In his diary or his notebooks, he’d often write, “Have I done anything? Have I done anything?” Over and over. And I’ve felt like that. I mean, sometimes there will be days I haven’t done anything today. Walter Isaacson: You know, this is the emotion I want everybody to feel every few pages of the book. Which is to be a little bit sort of surprised and then also say what you just said, which is, oh, I’ve done that. Or, I felt that way. Or, I’ve been distracted. And to realize the human connection we can make to Leonardo da Vinci and then the inspiration we can get to say, oh yeah, I used to wonder how a bird wing worked. I even wondered why the sky was blue. Or how would you measure the sun? Maybe, if we’re really wild, we’d say, I even imagined once trying to figure out what the tongue of a woodpecker looked like. But I outgrew that. I quit asking those questions. So, maybe, I should be inspired to go back and appreciate the quirkiness of Leonardo and appreciate the quirkiness in ourselves. And every now and then, be curious about things. Be curious just for curiosity’s sake. Brett McKay: Well, your book did inspire me to do this. So, I went out and I bought an anatomy book, after reading about his experiments with anatomy and I remember in the book, you talk about how da Vinci had planned on taking his anatomy drawings and turning it into a book or a treatise, but he never did that because something else caught his fancy. But what I was struck by is these illustrations in this anatomy book that was published a decade ago looked pretty much exactly the same as the illustrations that da Vinci did over 500 years ago. Like exactly the same. Walter Isaacson: He did art to science and one of the things that he invents probably not even intentionally is what you and I would call the visual display of information. Whether you’re an old magazine editor like myself, or a web designer, you realize, okay, how would I do this in layers? How would I make an aerial view like Leonardo did of the town of Imola when he was working with Machiavelli that shows the buildings in three-dimension. How would I take a dissection of a human body and do layers and layers so that you can flip the page and see what happens when you go down deeper? So, that ability to do visual display of information is a key. It’s what Steve Jobs saw when he went to Xerox Park and said, oh, I can do a graphical user interface on the new Apple computers. That ability to connect humans to nature through great visual displays is a talent that we don’t often focus on. That’s something, just like inventing the airplane or something, inventing those abilities to convey information visually and help us visualize is just an extraordinarily important thing. Brett McKay: So, last question. We’ve been talking about that da Vinci developed this power of observation, this curiosity, I mean, da Vinci lived 500 years ago. Twitter didn’t exist. Instagram didn’t exist. All these digital things that are distracting us, that make it hard to really observe didn’t exist. So, based on your research and writing of da Vinci, what can we learn from him about staying focused and observing intensely on things, even in this crazy digital world that we live in? Walter Isaacson: Yeah, he had distractions, too. I mean, Gutenberg inventing the printing press is up there with the invention of Twitter as a way to communicate and get information. But what he was able to do is pause, and put things aside and look at very ordinary things and marvel at them. To see how light hit a curved leaf and how the shadow was formed behind the curved leaf when the sun hit it. But also how there’d be a spot of luster, one of those shiny spots on the leaf, and that the spot of luster moves when you tilt your head, whereas the shadow doesn’t move in the same way. These are pretty interesting observations, but there’s something an eight-year-old could make and he teaches me, even as I was walking today in Manhattan getting ready to do this podcast, and I’m walking through Central Park and the sun is out. And even though I’ve got my iPhone with me, and even though I could go on Twitter to look up what people are saying about this, that, and the other thing, instead, I said, no, no, no, let me force myself. Let me look at the light hitting the ripples on the Central Park Lagoon and let me see how the reflections sort of flutter onto the leaves and let me just occasionally marvel at the simple things in nature that we don’t observe. That’s not that hard to do. It just requires keeping your phone in your pocket for a minute and not checking your Facebook page or Twitter feed or SnapChat in conversations and instead saying, I’m actually going to observe something and I’m gonna observe it carefully and closely and I’m gonna do it for no useful reason. I’m just gonna do it out of curiosity, pure curiosity. Brett McKay: Walter, this has been a great conversation. Thank you so much for your time. It’s been an absolute pleasure. Walter Isaacson: Well, you’re a pleasure to talk to, thank you so very much. Brett McKay: My guest today was Walter Isaacson. He is the author of the new book biography on Leonardo da Vinci. It’s called Leonardo da Vinci. It’s available on amazon.com and bookstores everywhere. Also, make sure to check out his other books about Benjamin Franklin, which is really good, the Steve Jobs biography, fantastic as well. Also, check out our show notes at aom.is/davinci where you can find links to resources where you can delve deeper into this topic. Well, that wraps up another edition of The Art of Manliness Podcast. For more manly tips and advice, make sure to check The Art of Manliness website at artofmanliness.com. If you enjoyed the show, you got something out of it since you’ve been listening to it, I’d appreciate if you’d take one minute to give us a review on iTunes or Stitcher. It helps out a lot. And if you’ve already done that, please share the podcast with your friends. The more the merrier around here. As always, thank you for your continued support and until next time, this is Brett McKay telling you to stay manly.